Yup, new IKEA catalogue checked for useful stuff, newest DVD we watched yesterday, shown to my brother – I thought he would take it home with him, but he probably forgot. 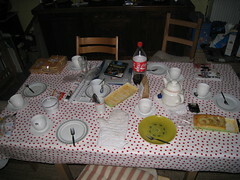 Now it’s almost midnight and I need to clear the table for breakfast for tomorrow morning – better switch on the dishwasher too, or we haven’t got any breakfast plates – we were down to odds and ends already. Rein's Cookumentaries and other Stuff is powered by	WordPress 3.3.1 and delivered to you in 0.664 seconds using 41 queries.